CafePress.com, a website where users can create and sell products using their own custom designs, is announcing a redesign today that President Sumant Sridharan said will simplify the product creation process. There are actually a number of recent changes that the company has been rolling out on its website, but the launch of the “Smart Product Engine” may be the most significant. 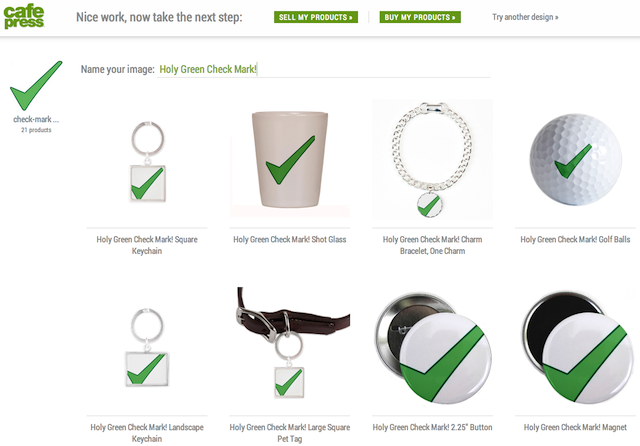 Previously, Sridharan said that creating a CafePress product with your own designs would take an average of two hours. The new process takes a matter of minutes. Sridharan gave me a demo of the new features. He uploaded a version of the TechCrunch logo, then the product engine automatically recommended the types of products where the logo would look the coolest, and it showed us what the logo would look like on those products — no additional adjustments required. Apparently there are “dozens” of factors being examined to make this match. Some designers may still want to spend hours making sure every aspect of the product matches their specifications exactly, Sridharan said — this just gives them an “easy option” too. Plus, you don’t have to be a professional designer to use it. “This is really taking advantage of the phenomenon that people are creating so much content,” he said. In addition to the product creation features, CafePress.com has also added the ability for designers to create a public profile, so users can follow them on the site and see when they create new products. And there’s a new look for the homepage — Sridharan said “the entire thing is going to be focused on the design community,” and indeed, the main section of the page highlights new designs and noteworthy designers. CafePress says it has 2.5 million active sellers on the site with a catalog of 532 million unique products. The company went public last year. And here’s a video of a panda explaining the site’s new features, because why not.